Don’t you ever wish you could look Facetuned in real life? 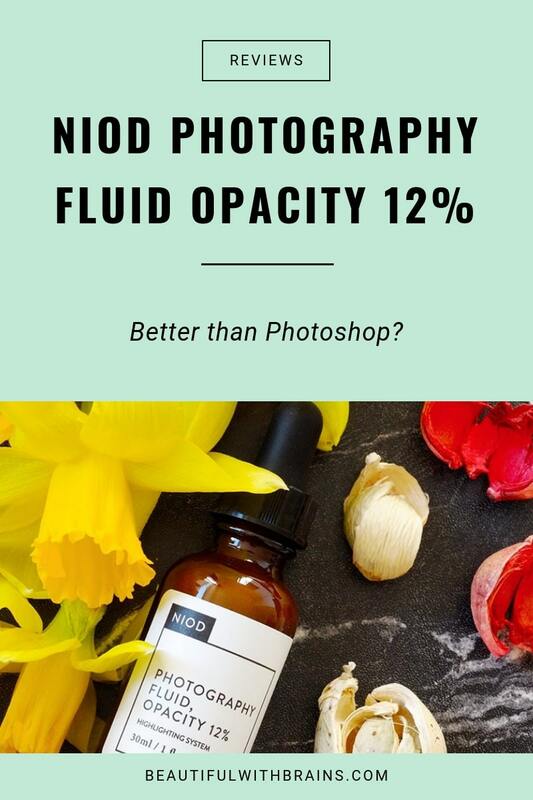 Get yourself a bottle of Niod Photography Fluid Opacity 12%. It’s like having a makeup artist, digital photographer and Photoshop all rolled into a bottle. I know, it sounds insane. I picked this baby up on a whim, thinking it’d be just a fun gimmick to try and OMG, I can’t live without it now. Hear me out, please. I know silicones have a bad rep, but there’s a reason you’ll find them in every makeup primer. They blur imperfections like nothing else. It works like this: silicones create a protective barrier on the skin. When the light hits its, they reflect it, giving off a natural glow that blurs out any imperfections in the area. Your large pores, fine lines and any other imperfection is still there. But other people won’t notice them anymore. If not invisible, they’ll look much smaller. Trimethylsiloxysilicate: a silicone resin that creates a non-tacky film over the skin to help makeup last longer. Hexamethyldisiloxane: a thin and volatile silicone that helps formula spread easily onto the skin before it evaporates into thin air. Cyclopentasiloxane: a thin and volatile silicone that makes skin so soft and smooth. Dimethicone: it fills in fine lines and wrinkles and makes skin silky soft. But wait, don’t silicones suffocate skin? Nope. Silicones have a particular molecular structure made up of wide molecules with big gaps in between. Your skin can still perspire though these gaps. Related: The Truth About Silicones: Are They Really Bad For Skin? Silicones aren’t the only ones that can pull off a trick or two with lights. Niod Photography Fluid Opacity 12% also uses a Nano-Prismatic Blurring Suspension to mask imperfections. That’s a fancy way to call mica and titanium dioxide. I’m sure you know titanium dioxide. It’s a common UV filter. Mica is a common mineral powder. Here, they do the same job: they reflect light away from dark spots, wrinkles, large pores and co, so it looks like they aren’t there. You can’t see what’s blinded by the light, right? Niod Photography Fluid Opacity 12% is a pale, shimmering gold liquid you can use on its own or mix with your fave primer/foundation. I tried it on its own first. Once you’ve got a skincare routine that works for you, you can say goodbye to foundation. On most days, I don’t use it. On it owns, it’s hard to apply. It doesn’t spread easily on the skin and tends to cake a little. If you’ve got any dry patches, this’ll make them look 10x worse. But OMG, it makes my skin looks amazing. It’s like a highlighter for the face that makes you look radiant. Every time the lights hits my face, I positively glow. My pores look invisible. My fines lines, almost. You can’t really notice them that much anymore. 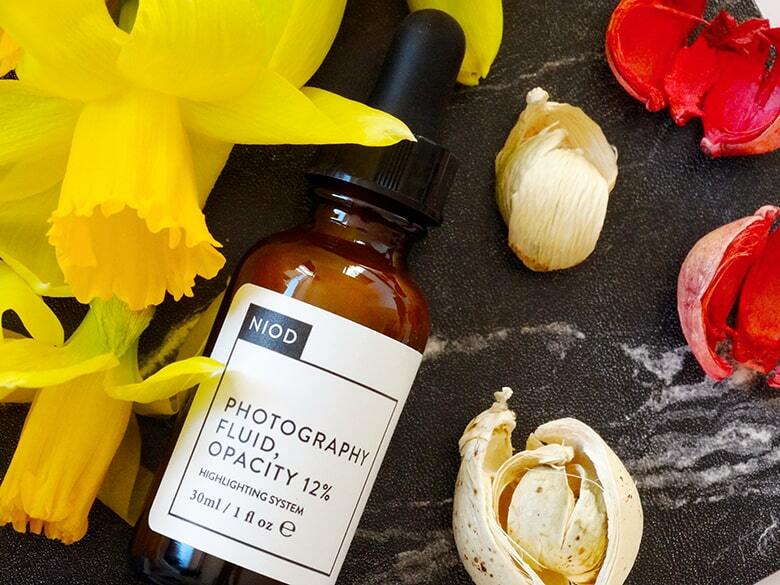 If you’ve got any sallowness or redness, Niod Photography Fluid Opacity 12% will hide those too. But if you’ve got some serious imperfections to hide, like a sprinkle of dark spots on your chin, you need to mix it with your foundation. Heck, even mixing Niod Photography Fluid Opacity 12% with a tinted moisturizer turns up the coverage a notch or two. Seriously, it’s like wearing a Facetune filter that makes you look flawless from every angle. Mixing it with foundation or primer makes it much smoother to apply. It glides on easily and doesn’t look cakey here and there anymore. It’s magic in a bottle, I tell you. The only thing I don’t like? The packaging. The fluid is a little too thick for the dropper bottle and tends to accumulate (and dry out) at the edges. But hey, it’s a small price to pay to look flawless, right? Niod Photography Fluid Opacity 12% is a shimmery gold liquid that uses light-reflecting particles to blur out any imperfection and make you look more flawless than any Snapchat filter. But it's hard to spread and tends to cake when used alone. 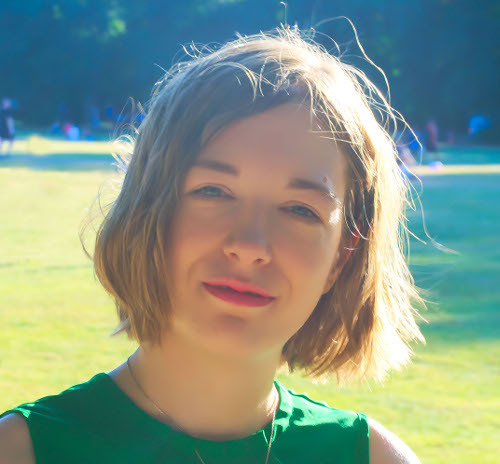 Have you tried Niod Photography Fluid Opacity 12%? Share your thoughts in the comments below. Ingredients: Aqua (Water), Trimethylsiloxysilicate, Titanium Dioxide (CI 77891), Hexamethyldisiloxane, Hylocereus Undatus Fruit Extract, Mica (CI 77019), Cetearyl Isononanoate, Propanediol, Simmondsia Chinensis (Jojoba) Seed Oil, Ceteareth-20, Cetearyl Alcohol, Glycerin, Cyclopentasiloxane, Glyceryl Stearate, Pentylene Glycol, Sodium Hyaluronate, Fructose, Glucose, Maltose, Trehalose, Sodium PCA, Urea, Sodium Lactate, Allantoin, Squalane, Polypodium Vulgare Rhizome Extract, Cetraria Islandica Thallus Extract, Sphagnum Magellanicum Extract, Solanum Lycopersicum (Tomato) Fruit Extract, Methyl Methacrylate/PEG/PPG-4/3 Methacrylate crosspolymer, Polyacrylate Crosspolymer-6, Hydroxypropyl Methylcellulose, Hydroxyethyl Acrylate/Sodium Acryloyldimethyl Taurate Copolymer, Ceteareth-12, Cetyl Palmitate, Dimethicone, Dimethicone/Vinyl Dimethicone Crosspolymer, Amodimethicone, VP/VA Copolymer, Adipic Acid/Neopentyl Glycol Crosspolymer, Tin Oxide (CI 77861), Citric Acid, Sodium Hydroxide, Sodium Chloride, Sodium Metabisulfite, Benzoic Acid, Caprylyl Glycol, Phenoxyethanol, Chlorphenesin. This is a product that I can’t live without it since my daughter bought it for me as a present !! Its awesome !! Christina, it’s amazing, isn’t it? I’ll have to try it mixed into another primer–on its own, I find that it actually highlights my pores too much. Too shiny for me.